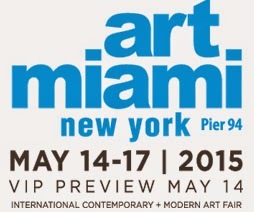 Art Miami New York will open its doors on May 14, 2015 in New York City at the world renowned Pier 94, site of the annual Armory Show each March. The fair will debut during Frieze Week, one of the busiest and most exciting weeks of the New York 2015 art and cultural season, alongside the highly-anticipated post-war and contemporary art sales at the major auction houses. Art Miami New York will commence with an elegant invitation-only VIP Preview on Thursday, May 14 from 2–5 PM. The VIP Preview will provide collectors, art advisors, curators, and members of the press with a the first look and opportunity to acquire the finest works available in the market before the fair opens to the public that evening through Sunday, May 17. “We are thrilled to have the opportunity to bring the Art Miami quality, brand, style and ambiance to New York City during this important week for the acquisition of contemporary & modern art. Art Miami New York promises to be a world-class fair and we look forward to welcoming the worldʼs leading art collectors, art advisors, curators, institutions, designers, artists and art enthusiasts to this new annual springtime event at a fantastic venue,” said Nick Korniloff, Art Miami New York Founder, Fair Director, and Partner. Art Miami New York will provide a fresh opportunity to acquire important never-before exhibited works from both the primary and secondary markets in an intimate light. The fair will cater to both seasoned and new art collectors who are looking to experience the best of what the global contemporary art market has to offer in New York City. The versatile and rich selection of works on display will have a strong focus on emergent talent, as well as mid-career cutting-edge artists, anchored by a fresh selection of secondary market works by top name artists from the Modern & Post-War eras. It is estimated that nearly 1,200 artists from over 60 countries will be on display at the fair. Art Miami New York exhibitor applications are already being accepted and are available online at www.artmiaminewyork.com. The top 100 international galleries will be carefully selected by a Dealer Selection & Advisory Committee, which will be announced at a future date. The Selection Committee will work closely with Korniloff, as well as participating galleries, to ensure a carefully-curated, rich-in-content, quality presentation, allowing collectors, institutions, curators and art advisors to buy with confidence. These prestigious galleries will exhibit within the intimate and modern setting of Pier 94, set against the dramatic backdrop of the Hudson River. Featuring a 133,000 square foot exhibition hall at 55th Street and the West Side Highway, Pier 94 is located in the heart of Midtown Manhattan within close proximity to the Chelsea art district, museums and major auction houses. Produced by the Art Miami team, the largest and most seasoned and professional art fair management, marketing and promotion team in America, the fairʼs refined ambiance will be welcoming and appealing to all levels of visitors, from the seasoned collector looking to acquire new works to the budding art enthusiast looking to create a collection. Art Miami New York will complement the Frieze art fair, offering all Frieze VIP cardholders with complimentary admittance to Art Miami New York, as well as courtesy shuttle service to Pier 94 from the Frieze Ferry (located on 35th Street), select major auction houses and the Chelsea arts district. For more information, please visit www.artmiaminewyork.com.